Stravinsky is the root, the seed, the humus, and the feeding ground. A ground that not only nurtures the intricate tree that is 20th century music, but also the tender and new, or rather, ever-new branch this disc represents. The Octet for Wind Instruments (1923) is in fact the matrix from which the four pieces that accompany it gemmate, almost by spontaneous germination. The correspondences can be found in two statements about the Octet that Stravinsky expressed in his writings, which are complementary to each other. “As I was writing the last movement – wrote Stravinsky in the Conversations with Robert Craft – the Two-Part Inventions by Bach were lying somewhere in my subconscious. The neatness and the clarity of the Inventions represented, at that time, my ideal of writing”. As Robert W. Mann – a forgotten, but erudite composer – said, more than two colours are needed to highlight the contrapuntal parts of the Inventions: in the play of the voices there emerges always a third, or even a fourth voice. The second statement is much more aesthetical than technical: “My Octet is a musical object. This object has a form and the form is influenced by the musical material by which the work is composed. It is a work based on objective elements, completely self-sufficient” (I. Stravinsky for the Arts Magazine, 1924). These are the two categories - with respect to linguistics and aesthetics - that illuminate the formal skeleton in Stravinsky’s Octet. These categories represent also, and not accidentally, keys for browsing the pages in which the other four works of this album elegantly find their place, revealing to us their own identities, identities that are strengthened through their differences. In the Octet for winds by Peter Eötvös (2008), written in memory of Karlheinz Stockhausen, the paradigm of objectivity lies in the absence of any narrative intent. The writing proceeds in a compound of vertical cues whose transitions are entrusted mainly to the flute, the clarinet, and the bassoon’s concise perorations. Hidden polyphony emerges from the contrast between the fast and tense passages of the woodwinds and the steadily held support of the brass section. 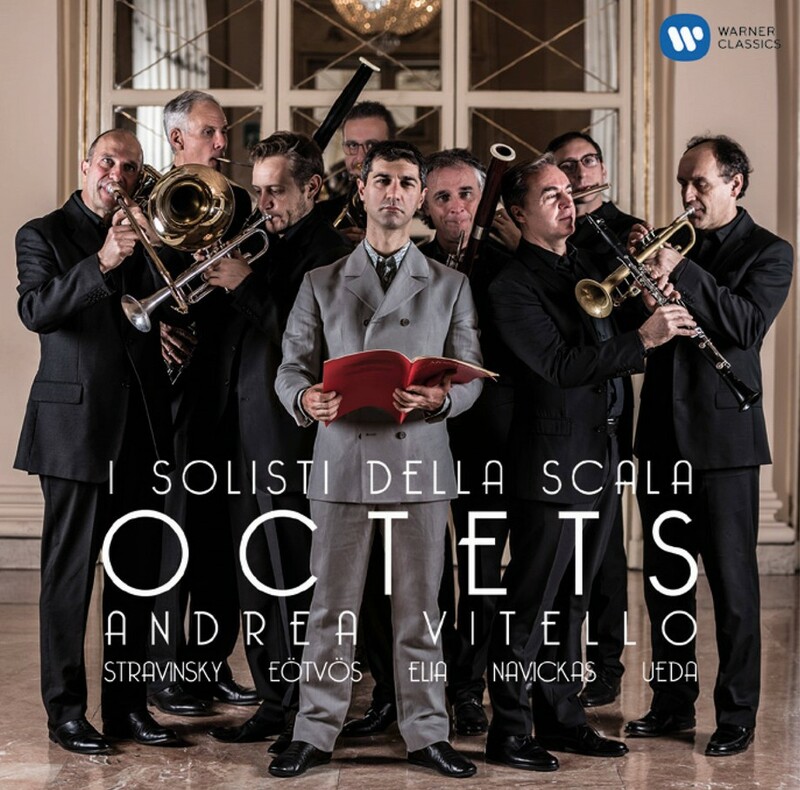 In the Octet written in 2016 by Alessio Elia, the musical elements, or their strongly contrasted combination, significantly shape the structure of the piece. The utilization of different temperaments – a technique defined by the composer as “polysystemism” – further emphasizes his concept of sound as a phenomenal entity. The first part recalls the characteristic of a toccata, punctuated with the violent, sometimes bitter, intrusions of the trumpets, trombones and flute, which is mostly scored in the highest register. In the second movement – clearly distinguished from the previous one – woodwinds and brass are reunited in a slow and solemn chorale, coloured in dark and blurry tones. In by heart (2017) the 31-year-old Lithuanian (but adopted Parisian) composer Albertas Navickas breaks down the instrumental filigree in subtle whispers: the brass and woodwinds are often scored in unpitched “blow” effects. The sounds progress into an abstract and disconnected galaxy in which the relationships and similarities between each part are torn apart, deconstructing the foundation of polyphonic writing. condenses the sound in thick, sometimes screaming, conglomerates of matter, an unexpected texture of colours and tones shines through. Therefore her work, like the others, all nourish their branches from the humus: the same that grew the immeasurable and incredibly fertile tree of Stravinsky.